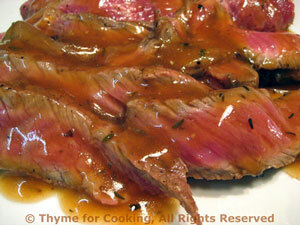 Barbecued Steak with Madeira Sauce, quick, easy recipe. Put steak in a deep dish - a baking dish or roasting pan works well. Mix all ingredients for marinade and pour over steak. Let marinate at room temperature for 30 minutes or refrigerate 3 - 5 hours (up to 24 for less tender cuts). Cook on barbecue grill over direct heat for 4 - 6 minutes per side, basting occasionally, - or until done - 140 F for rare. Use thumb test, meat thermometer or by slicing into center and looking. When done, remove from heat and let rest for 5 minutes. To serve, slice thinly and serve with Madeira sauce. Can be cooked under broiler - start with 5 minutes a side, basting each side once. In small saucepan bring marinade, stock and Madeira to boil. Add half of the cornstarch mixture slowly and stir until thickened. Add the remaining half slowly if you would like the sauce thicker.